If we look at the web applications, the idea behind most of them is to fetch data from the database and present it to the user in the best possible way. When we deal with data there are cases when the best possible way of presentation means creating a list. Depending on the amount of data and its content we may decide to show all content at once (very rarely), or show only a specific part of a bigger data set. The main reason behind showing only part of the existing data is that we want to keep our applications as performant as possible and avoid loading / showing unnecessary data. If we decide to show our data ‘in chunks’ we need a way to navigate through that collection. I created an example with a list of random articles, each one containing a short description, image, and a link to the source of the article. We will go through the process of creating a component that is in charge of displaying that list, and triggering action that fetch additional articles when we reach the end of the existing collection. That means creating an infinite scroll component. Let’s see how to build it. Let’s start by creating a component that will show a list of articles (but without infinite scrolling just yet). We’ll call it ArticlesList. 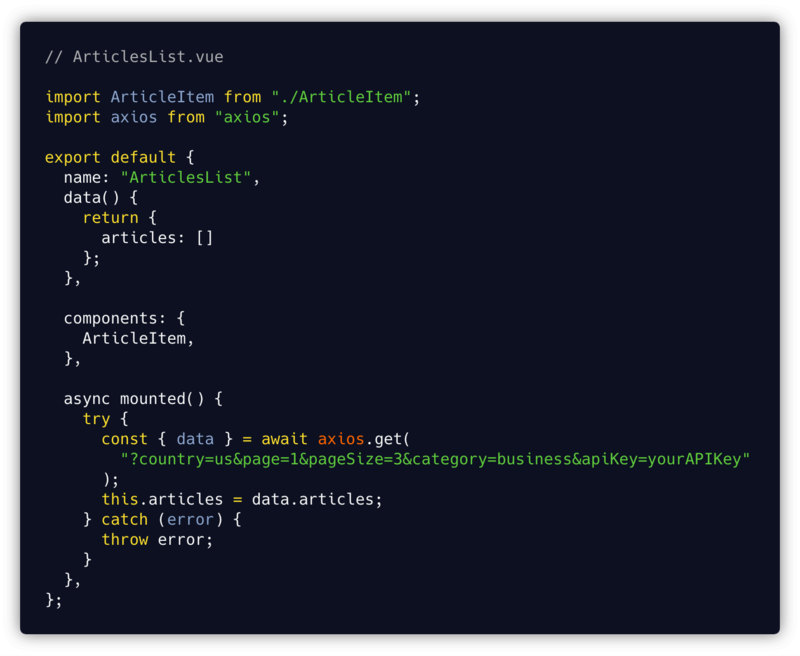 In the component template, we’ll iterate through the set of articles and pass a single article item to each ArticleItem component. 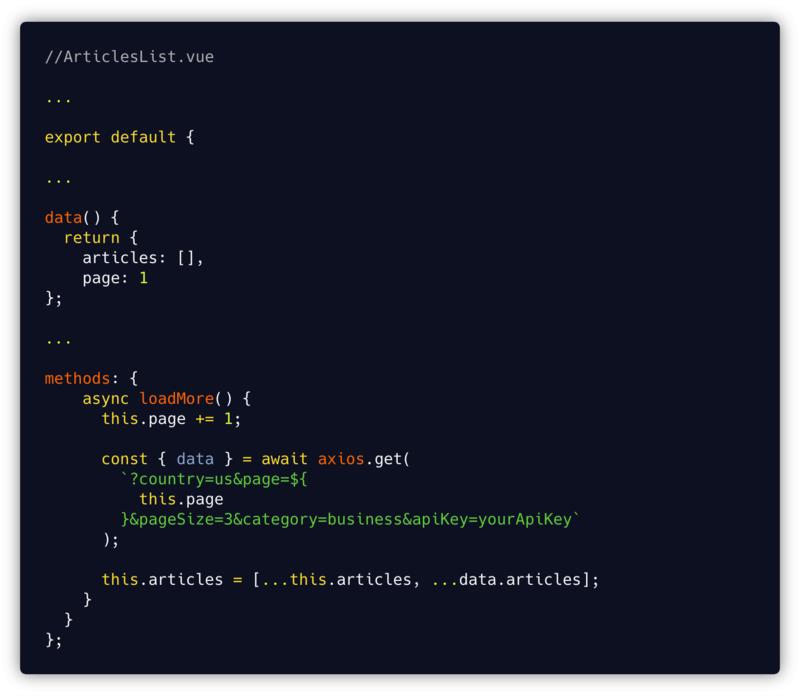 In the script section of the component, we set initial articles to an empty array and fill that array with data fetched from the API on mounted hook. At this stage we fetch only first page of the news feed. That will give us a list of first three articles. Now we need to create a method that will load next page, we also need to keep a reference to our current page and increment that value before loading fresh data. 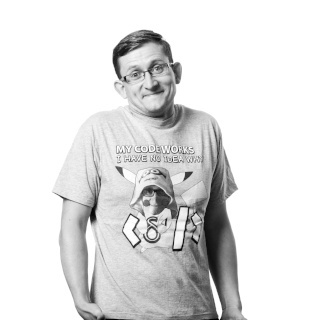 We will add a page prop to our data to keep the value of last loaded page. In loadMore method before loading new articles we increment the page value and fetch the next batch of data from the API. Upon receiving new data we merge the existing articles array with the fresh data containing next page of articles. Now we have the loadMore method, but we do not fire it anywhere. We need to find a way to detect if user reached the end of our list and fire loadMore then. Create a component that will be rendered below the last element on the list. Detect when that component becomes visible to the user and trigger the request to load more articles. Our Trigger component doesn’t have to contain anything except one '<span>' tag as below. That was the easy part, now we need to detect when that component becomes visible to the user and trigger the request to load more articles. How do we do that? Believe me or not, but that better way exists, and it is called Intersection Observer. This provides a very efficient way of detecting if an element is visible in the viewport. Specifically, it allows you to configure a callback that is triggered when one element — called the target — intersects with either the device viewport or a specified element. We will put all that logic in our Trigger component now. Let’s break this code into pieces and explain what is happening. root as our reference object, which we use to base the visibility of our watched element. It might be any ancestor of the object or our browser viewport if we pass null. threshold value that can vary from 0 to 1 and tells us at what percent of the target’s visibility the observer callback should be executed, with 0 meaning as soon as even one pixel is visible and 1 meaning the whole element must be visible. In 'data' we set initial value of observer to null. This is the value that will be changed when we create our Intersection Observer. The core logic lives in the component’s hook function. That function allows us to fire a custom logic at a specific moment of a bound element lifecycle. In our case we will use mounted hook. In there we create an intersection observer. The IntersectionObserver constructor accepts a callback (handleIntersect function) that is fired when the observed element passes the specified threshold and the options object that carries our observer options. It also has access to entries, which is an array of all elements that are watched by the observer. And then, after creating the Intersection Observer, we attach it to our component using the observe method. In the handleIntersect function we emit a triggerIntersected event when certain conditions are met. Specifically, it is fired when Intersection Observer detects that the element enters the viewport or a parent component element. This event will be then caught by the parent component and used to trigger loadMore function. The last thing we need to do with our Trigger component is to stop watching for the component intersection before it gets destroyed. To do that we, again, use hook function, specifically beforeDestroy hook, in this case. Step 5: Catch the triggerIntersected event and fetch additional articles. 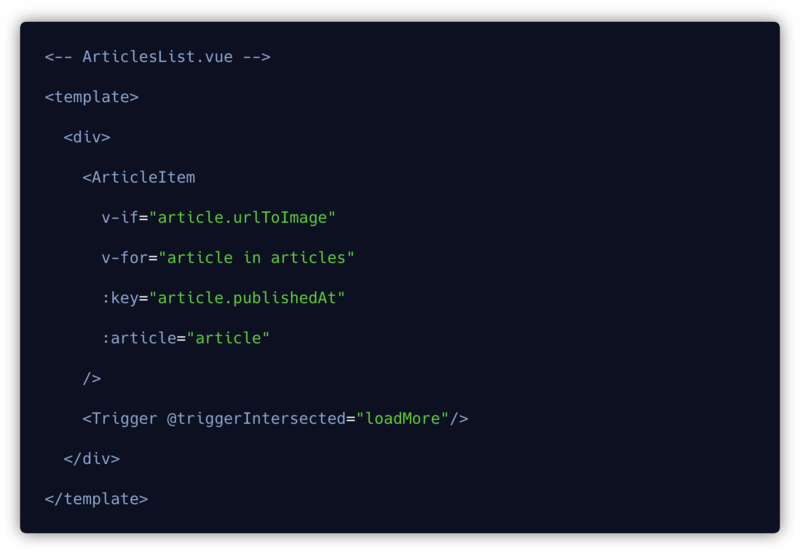 The missing piece is a connection between that moment when our Trigger component becomes visible in the viewport and our loadMore method responsible for loading more articles. 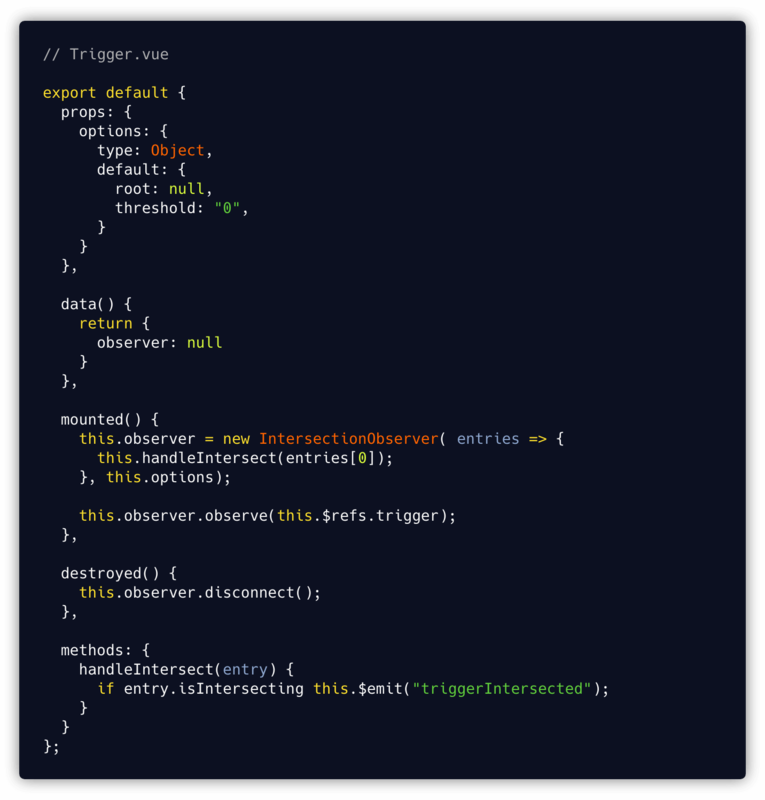 Our Trigger component creates an Intersection Observer and emit an event when the component enters the viewport. What we need to do now is catch that event in or ArticlesList component. We do that using v-on directive (or @ shorthand) that needs to be attached to our Trigger component. That will fire loadMore method each time Trigger component emits triggerIntersected event (each time the component enters viewport). As the infinite scroll may sound like a solution for all lists, it is not the best solution in all cases, it may look fancy, but in some cases it can cause more harm than good. It is not recommended for goal-oriented finding tasks, requiring people to locate specific content or compare options. Imagine looking for a specific search result that appears on a certain page of the search results. Using infinite scroll in this case makes it hard to find it as we need to trigger the infinite scroll many times to reach our desired page and find our item. Having pagination in that case allows us to find the item (as long as we remember at which page it was) in literally two clicks (one for page, second for item). Infinite scrolling shows its potential for content that streams constantly and has a relatively flat structure (each item is at the same level of hierarchy and has similar chances of being interesting to users). For example, a stream of news. In that case we are exploring the news rather than looking for something specific. We do not need to know where exactly the news is and how much we scrolled to get to a specific news, it makes the user experience more engaging in that case and saves us the effort of clicking next each time we reach the end of current page.